The Happiest Day in the Life of Olli Maki revolves around a boxer, the titular character, a local Finlandian hero, who is given the chance to go one on one with the world champion in his class, an American. But there are two issues getting in the way. Olli’s trainer needs him to lose weight to box in a class one level lower than Maki normally boxes in. But even worse, perhaps, Olli is in love. He has met a young women whom he adores and who is accompanying him to prepare for the match. Nothing much happens in the story. It moves along at its own leisurely pace. It, and Olli, are very ingratiating and likeable and the relaxed nature of it all tends to win you over. At the same time, as pleasant as it is, it doesn’t really do much more than that. It’s a good time in the theater, but, when all is said and done, I’m not sure it’s anything more than a shaggy dog story. The message, perhaps, might be a little muddled. It seems to suggest the outcome of the match might have been due to Olli’s emotional state. However, a just as likely cause could be due to the training he had to undergo in order to fight in a class he probably shouldn’t be fighting in in the first place. Or probably the most likely cause, Olli was going to lose no matter what because the American boxer was simply better. Written by Mikko Myllylahti and the director Juno Koosmanem. With Jarkko Lahti as Olli, Oona Airola as his love Raija and Eero Milonoff as his trainer Elis. Based on a true story. 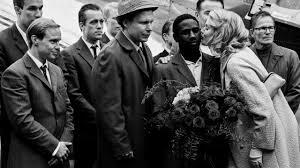 At the end of the film, Olli and Raija encounter an elderly couple. They are the real Olli and Raija. There’s no boxing in writer/director’s Terence McNally’s new film A Quiet Passion, a meditation on the life of the great American poet Emily Dickinson. However, everyone seems to be in a life or death struggle to be the wittiest person in the room. It’s as if the court of Louis XIV had been transplanted into the repressed Protestant background of New England. It’s as if Oscar Wilde had been reincarnated years before he was born. It’s as if the Algonquin round table had been possessed by the spirits of Dickinson’s contemporaries. Everyone says their lines as if they were staircase wit. Actually, they say them as if they were staircase wit written months before and heavily rehearsed before anyone made it to the second floor so they could leave and come up with the perfect line they should have said while descending the staircase. And they say their lines carefully posed, as if for a pageant, or waiting for the picture to snap in a 19th century daguerreotype, hesitant to make any quick movements. This description may sound as if I intensely disliked the film. But truly, I did not. I found it beautiful and transcendent (an appropriate adjective for a drama taking place in early 19th century America). A riveting and intense look at a great poet, great in spite of the fact that Dickson had only a handful of her work published during her lifetime. But I do have to give forewarning. At first, A Quiet Passion may seem overly posed and stagey. And I have to admit, there is something a little off putting at first. It has to grow on you. You have to allow yourself to become one with it, let it work its effect on you. In the same way that you can’t read a Victorian novel with a modern attitude, this film cannot be watched like a usual film. Its power slowly takes you over until you find yourself responding to the film like a piece of music that grows in passion as it is played. Dickinson is incarnated by Cynthia Nixon who gives a rich and touching performance. Nixon is so embedded inside Dickinson, you almost believe that Dickinson’s main reason for existing is so Nixon could eventually play her. And her reading of Dickenson’s poems is wondrous. 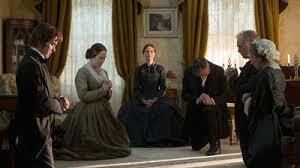 With Jennifer Ehle and Duncan Duff as Emily’s siblings; Jodhi May as a family friend; Catherine Bailey a life force as Emily’s modern woman friend; and Keith Carradine as her father, one of his best performances.